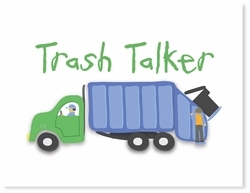 You will receive a high resolution PDF for your at-home use to make your own Trash Talker tee! The file will contain two versions, one as pictured and the other reversed for flexibility of use with the various kinds of iron-on shirt transfers. You are purchasing the image file only, not the printed image transfer or the finished t-shirt. Pink Peppermint Paper, LLC. retains all rights to this image. The rights to use or sell for profit items featuring this image are not included with this purchase.